WWE: Smackdown 4/23/15 Recap!! Rough Night for The Champ! It was a rough night for WWE World Heavy Weight Champion as the WWE returned to Providence, RI for Smackdown. It was also a night that saw the WWE Superstars fight for momentum that would lead them into Extreme Rules on Sunday (which can be seen on the WWE Network, FREE for April!) So how was it pick on Seth Rollins night on the blue brand? Find out now! The festivities started well enough. Our beloved WWE World heavy Weight Champion, Seth Rollins graced the WWE Universe with his presence. He addressed Randy Orton being RKO happy and said he wasn’t too bothered that he was on the receiving end of one on Monday Night as the RKO would be banned for their Steel Cage match at Extreme Rules. The Director of Operations, Kane, felt that he needed to interrupt the undisputed future of the WWE to remind Seth, that he was the gate keeper on Sunday and it would behoove him to get on his good side as he now had Seth Rollins’ fate in the palm of his hand. Kane demanded that Rollins return the favor of laying down for him like he did for Seth a week ago. He even had a ref come out and ring the bell. Rightfully so, Seth refused to comply with the ridiculous request. his refusal enraged Kane as the Corporate Demon then threatened to reach down inside Seth and rip out his insides if he didn’t lay down. So under duress, our poor champion lay down and was willing to let Kane pin him. That is when the Director of Operations revealed that he was just joking around but that Seth’s true opponent wouldn’t be in such a joking mood. Kane revealed that Seth’s true opponent was Dean Ambrose and that their match was right now! Dean Ambrose began to come to the ring and as he got half way there, Luke Harper’s music began and he started stalking towards Dean. The Lunatic Fringe, seemingly between a rock and a hard place, dove into the ring and attacked Rollins only to be set on by J & J Security. 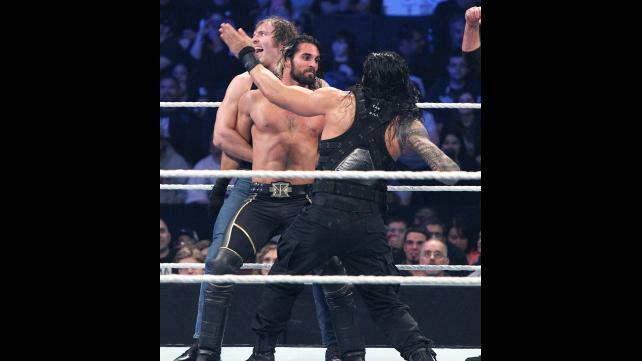 Harper joined the beat down and Seth, once back on his feet, joined in on the lunatic abuse as well. Just when it seemed that the WWE Universe was going to see the end of Dean Ambrose, Roman Reigns flew into the ring and cleaned house to save his brother. This match was intense from the beginning. Neville immediately got to work on cutting the big blindingly white tree that is Sheamus down to size by targeting the Irishman’s leg all the while using his speed to avoid getting hit himself. But it wasn’t long before Sheamus did get his hands on the smaller wrestler and punished him thoroughly, but again Neville surprised the WWE Universe and his opponents when he kicked Sheamus in the head to create the separation necessary to tag in Ziggler. But the Celtic Warrior was also able to tag in his partner, Bad News Barrett. The two former Intercontinental Champions were fired up as they went after one another. They exchanged blows and Barrett even got a near fall with Wasteland and but the Winds of Change was countered by Dolph into a near fall of his own. The end came when Neville made a hot tag, Ziggler hit the Zig Zag and the man that gravity forgot took aim and hit the Red Arrow on his fellow Englishman for the 1, 2, 3. This was the show stealing match of the night. There were other good matches but this one demanded that you pay attention to hit. The hard hitting violent moves of Sheamus made you grit your teeth and thank the Wrestling Gods you weren’t Neville. Watching Neville on the other hand is like visual crack. Your eyes become addicted to it. Dolph and BNB are always good in the ring and a treat to watch. All four men together? Gold. Natalya and Naomi faced off in a short but very physical match. There is a history between the two that made this match more fun to watch. These ladies came out hard at the ring of the bell. The two were evenly matched and exchanged maneuver after maneuver. but it was Naomi’s new aggressive take no prisoners style that ended up winning the day as she wore Natalya down and hit the Queen of Harts with a rear view to pick up the win. After the match Naomi put the final exclamation point on this budding rivalry by attacking Natalya before returning to the back. Naomi picked up a good deal of momentum heading into Extreme Rules where she faces Nikki Bella for the Diva’s Title. And this match showcased exactly what we can expect from the form Funcadactyl. She was impressive and even though Natalya put up a fight, it was not enough to win the day. would have liked to see them go a bit longer as they were telling a great in ring story. It was a treat to watch to Diva’s that are good at telling a physical story like Nattie and Naomi. I could definitely see Natalya being a number one contender to the Title if Naomi won it from Nikki. These two behemoths put on the hard hitting match that you would expect from them. Ryback controlled most of the match and had Rusev on his heels for most of it. It almost seemed as if the Bulgarian Brute was unprepared to take on the Big Guy. In his frustration at being unable to get the upper hand on Ryback, Rusev retreated to the outside. When Ryback went to retrieve his opponent, Rusev attacked him with the Russian Chain forcing the DQ. He then continued to assault the Big Guy locking him in the Accolade using the chain till he was forced to release it by officials. I’m gonna give it to Ryback. He is putting on better and better matches. When I first started doing these recaps, he was a blundering mess that made me really not want to watch him. Now, well the Big Guy has grown on me (even though he is a dissenter…) Rusev getting the DQ on this though was a bit of a let down. I’d liked to have see a real win ether by pin fall or submission. granted it does give him momentum going into his match with Cena, but it would have been a better push towards the title match to not get himself disqualified. One half of the tag team champions took on one third of the New Day. Cesaro used his strength to his advantage but Kofi countered with his quickness. But it was a distraction from Xavier Woods and Big E that allowed Kingston to hit Trouble in Paradise to pick up the pin fall victory going into Extreme Rules. This match was good, not stellar but good. Kofi and Cesaro work well together and I gotta say it was a pleasure to see Cesaro catch Kofi in mid air and go into a tilt-a-whirl back breaker. Really wish this match went on longer. It seemed like they were just getting started and then boom, over. The night ended with the mismatched pairing of our beloved WWE World Heavy Weight Champion Seth Rollins, and Luke Harper teaming up against Roman Reigns and Seth Rollins. Oddly enough, Harper and Rollins worked well together as they worked to dismantle the Lunatic Fringe. But once Roman was tagged in, all hell broke loose and the Power House, cleaned house! He Samoan dropped and suplexed Harper right out of his boots and he got a near fall with a Superman Punch but Rollins, like a ninja, flew in broke up the pin and saved the match for his team. The battle continued as all four men took the action outside the ring. Once the action returned to the ring it was the Undisputed Future against Reigns. 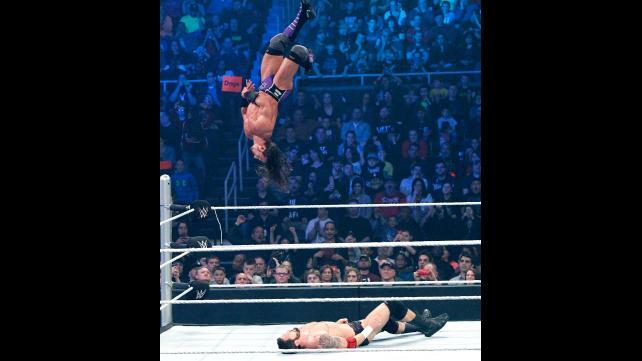 Seth took control with a flying knee from the top rope. The champion then showed that he truly can work with anyone as he and Harper showed tremendous team work with a turnbuckle power bomb followed by a wicked clothesline. It would have been the end and a victory for those who know what’s best for business but the Unstable one broke up the pin in the nick of time. Both legal men were then able to make the tags to their partners and that brought in Dean Ambrose to face Seth Rollins. At this point chaos broke out in the match that ended with Ambrose dropping a flying elbow from the top rope onto Harper, Rollins, and J & J Security. The ref began to count and got to 7 before Kane rose from his seat at ring side and threw Rollins back into the ring to break the 10 count. But who was in the ring waiting for Seth? Why Roman Reigns who then speared the champion in half after Dean rolled back in to tag him in. 1, 2,3 and Roman picked up the victory for his team. This is NOT what I meant when I said I wanted my Shield boys reunited in the ring. Just wanna throw that one out there but well played WWE. Well Played. I thought this match was so much fun. There is something truly magical that happens when Rollins, Ambrose, and Reigns are all in the ring together whether they are working as a unit or trying to tear one another apart. I did not like seeing Rollins get pinned and blame Kane’s jealousy for wanting a vulnerable Rollins in the ring with the fresh Samoan Superman. The Corporate Demon looked like the cat that ate the canary after the match. He knew what he was doing after all. He is a sick sick man who has been corrupted by the power he wields. He needs to get with the program and go back to protecting our champion versus fighting what is best for business. I do not see things ending well for Kane if he continues on this path at Extreme Rules. WWE: Raw 5/18/15 Recap!! Seth Rollins: The Architect of a Dream!!! WWE: RAW 5/4/15 Recap!! Fatal Four Way?!?! This entry was posted on Sunday, April 26th, 2015 at 2:59 am	and is filed under Events, News, Television. You can follow any responses to this entry through the RSS 2.0 feed. You can skip to the end and leave a response. Pinging is currently not allowed. « American Horror Story: Hotel Cast Run-down, Who’s Missing?!? !